Italy – Tell Me What It’s Like (In A Nutshell) – "Aye…brilliant"
Naples – scary place to drive – Stayed one day/night, but that’s where I flew into. Ate fabulous pizza my first night in Italy. Sorrento -across the harbour from Naples. Lemons, limoni everywhere you look! Stayed three days where we met Irish friends for drinks at where else…an Irish Pub and saw a wonderful outdoor sculptural exhibit of Benedetto Robazza’s L’Inferno di Dante. 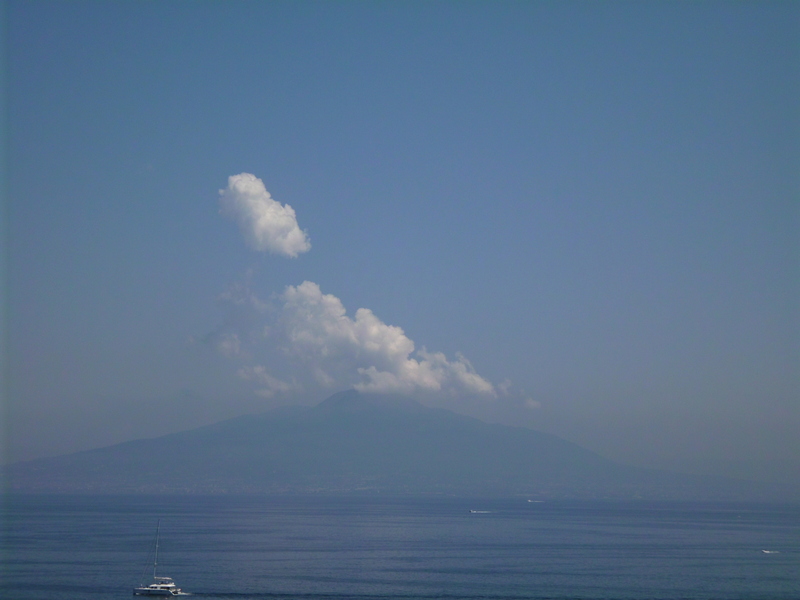 We also got to see the ominous Mount Vesuvius across the harbour. Maratea and Sapri – a few day trips to the sandy and pebbled beaches to search for shade and cold drinks. People watching is fantastic as everyone comes out at 5 o’clock to ‘promenade’ along the oceanfront walkway. 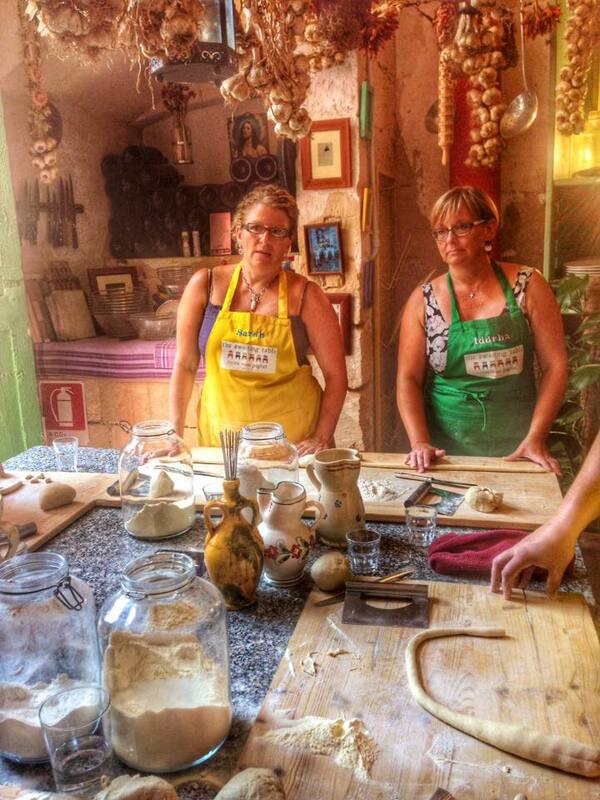 Lecce – 3 days where I took two fabulous cooking courses in Salentine cuisine and almost wilted in the 40 plus degree temperatures. It’s been 30 years since I’ve been dizzy in one of these! Cetraro – 3 days at the Grand Hotel San Michelle. All of the food and wine served there is grown and prepared on the grounds and you have to take an elevator down the cliff side to get to the beach. 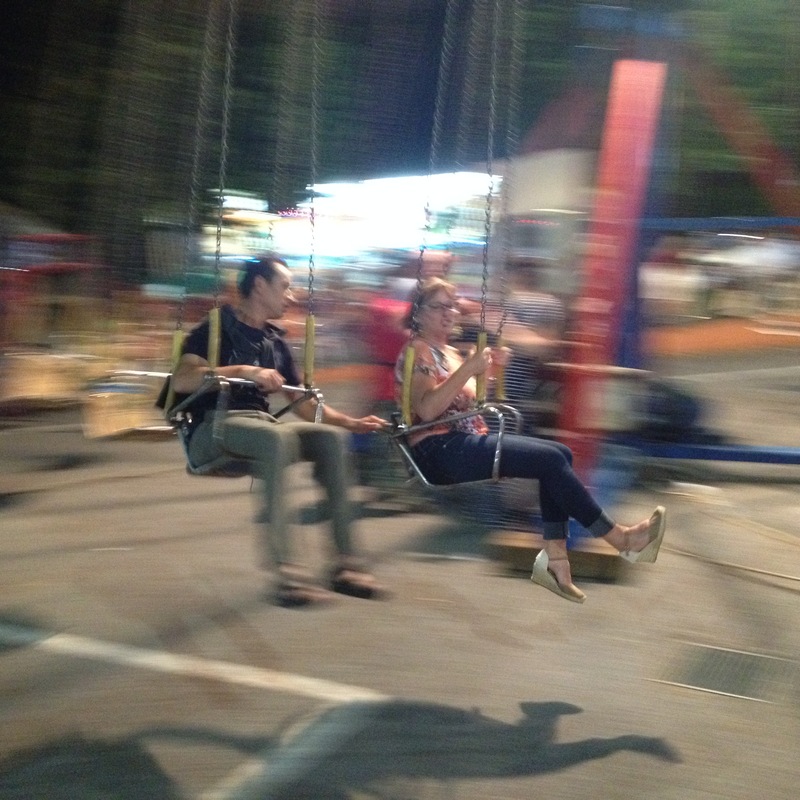 Nemoli – Attended a local festival where we ate fabulous street food, perused ‘authentic’ Gucci purses and bedazzled phone cases, shot down unsuspecting tin cans and bottles with rifles attached to the counter and had the most fun in one of those whirly swing things. That’s the touristy part. As for the daily adventures, we are staying just outside the village of Lago Sirino where we buy groceries, wine and ant killer at the supermarket, savour handmade gellato and cappucinos at Nives and eat fabulous pizza at Albergo/Ristorante de Mimi’s. Every Wednesday and Saturday we drive to Lagonegro for the farmers market, have coffee or an Aperol Spritz at the cafe next to a church. And for the past three Saturday’s in Lagonegro we watched the walking out procession of an Italian wedding featuring tossed rice, confetti exploders and the releasing of two white doves into the air (it was ridiculously entertaining watching so many well-dressed people try and catch them and return them to the basket). Mama Mia! On occasion, we take a jaunt to Rivello to have coffee and buy bread after picking up mail at the Postale Italiane. 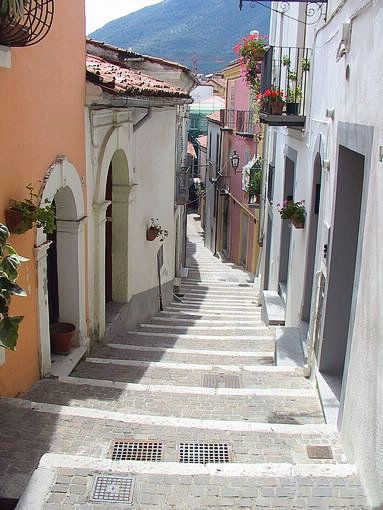 In Rivello, you park your car and climb the narrow, cobbled streets that often incorporate steps in the lane ways. And just for the joy of it, every now and then I visit my Romanian friend Michaela in Nemoli to hold her new baby Darius while his big brother, Constantine, watches cartoons, sneaks biscuits because there is company and tells me (in Italian) all about his puppy Billly. Billy has since had a name change. You ask, ” So what is Italy really like”? It is like no place I’ve ever been and not at all what I’d expected. It is so much more of all that is truly and completely wonderful. Posted on August 7, 2015 August 7, 2015 by jacquieharnettPosted in Happiness, Life stories, TravelTagged Italy, Travel. Next Next post: Fiats and Vespas and Goats – Oh My! Wonderful!!!! Reading your blog made me feel like I was there 🙂 Wish I was 😉 Your a great writer Jacqueline! Thank you Diana, for you kind words. I am having a fabulous time. Still have Rome, Pompeii and the Grand Prix to see and write about!